It’s only been a couple of weeks, but it feels like a lot longer. 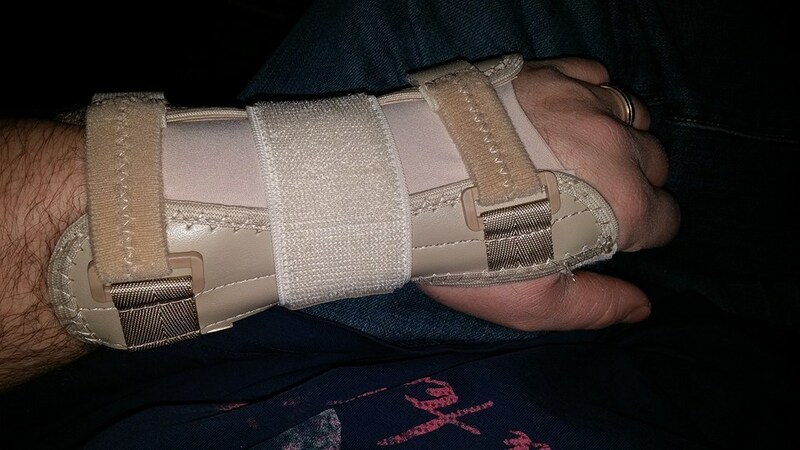 Two weeks ago this Saturday, I pinched a nerve in my left arm/wrist/hand. I’m not exactly sure where the damage was done, only that I have very limited use of my middle, ring, and pinky finger. Not only can I not lift them, but I have not been able to hold more than a couple of pounds, for any longer than a few seconds, before dropping whatever’s in my grasp. Now, I believe I have been slowly regaining some use of my fingers. I am now able to lift them (maybe) a couple of millimeters each, thus allowing me to return to work on my computer for short periods of time. However, I still have very little feeling in them. Even now, I am having to retrace every other word to correct the errors I cannot help but make. The tendons in my arm ache, my fingers tingle as if between awake and asleep, and even this simplest of tasks has reached a difficulty level that is nearly beyond my ability. Frustration has set in, along with a few other feelings I have only recently experienced through the eyes of my characters. Pain, helplessness, despair… To have something I have given myself to be limited, taken away from me, it is the ultimate punishment. Fortunately, thirty dollars has assured I am still capable of working my part-time duties without restriction. This little beaut immobilizes my wrist, thus allowing my hand to act as a support, rather than the equal to its mate. This is the part where I raise my right hand, point my index finger to the sky, and rotate my wrist so that it creates little circles. “WoooOOOooo! Big deal” I say while rolling my eyes. So it pays for the bills. It does nothing toward relieving this creative pressure that’s become bottlenecked up there. Characters, nay, stories are begging for release! Two weeks in, and all I get are a few measly millimeters for my efforts? My arm tightens up halfway through a sentence, causing me to pause as it unwinds, and wait for the feeling to return. I will be trying to exercise my way back to health, over the next few weeks, so I hope you’ll bear with me in this recovery period. New entries are coming in my webseries. Updates on my books to follow. Be well my friends, and I’ll try to achieve the same. This entry was posted in Various Thoughts, Posts and Ideas and tagged fiction, injured wrist, injury, longing to write, physical therapy, pinched nerve, R. Richardsson, recovery, see what I did there?, that last tag wasn't exactly legit, webseries, writing by R. Richardsson. Bookmark the permalink.